Articles of note from your mechanic sage, Paul. Look closely, this isn't something you are likely to see every day. Touch the picture to get a closeup. 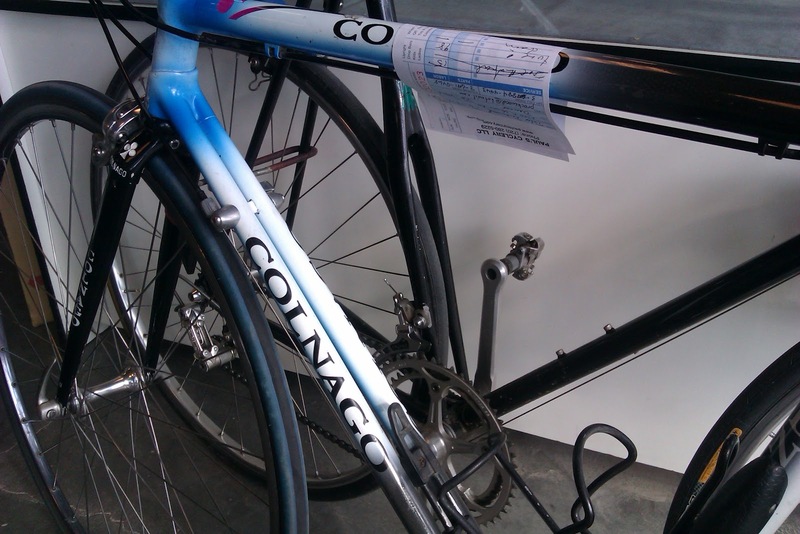 TWO twin-tube bike frames in the same picture, a Colnago (Italian) from late 90's and a Mecacycle (French) from mid-80's. 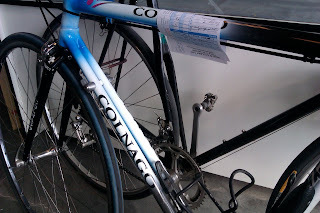 The Colnago is glued carbon with aluminum lugs, fancy and classy and probably rides great. All those glued joints, though are showing their age. The Mecacycle is handmade fillet-brazed steel (Vitus probably) which from a distance looks like just another old black beater, but up close shows the work of a master welder. An internal clamp like a quill stem holds the seatpost in place. The brake housing is routed inside the top tube. How many miles do you ride per week?